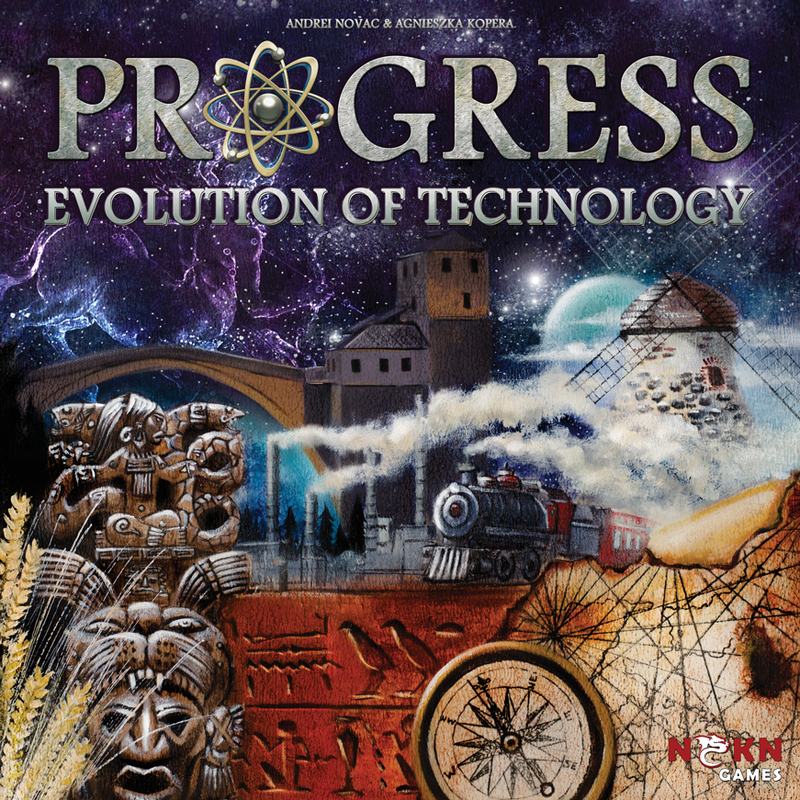 Progress is a card-driven civilization game where players try to expand the technologies of their civilization from Antiquity to the Renaissance and into the start of the Industrial Revolution. The technologies in the game are organized into three main areas: Science, Engineering and Culture. 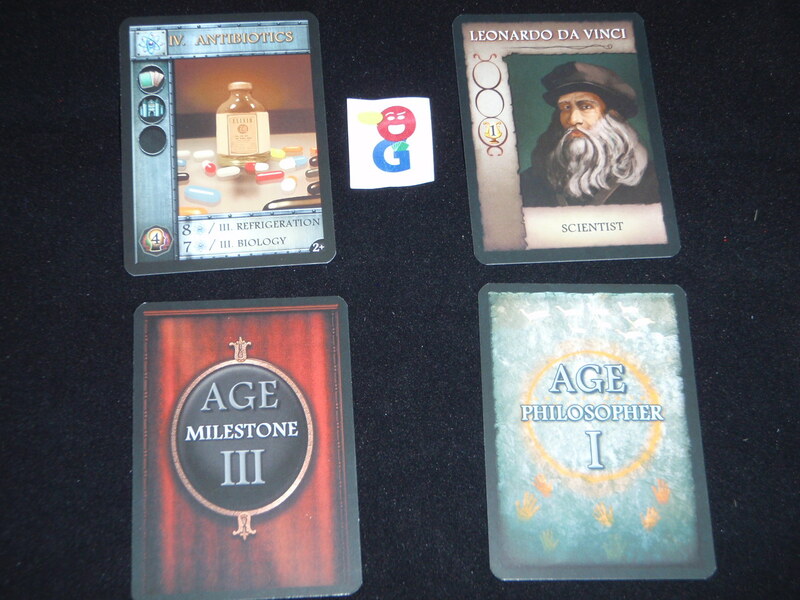 The game is played over 3 Ages, each with its own set of Technology cards – each representing a different historical era. At the start of the game, only the cards from Era I will be available. Cards from each era are kept separate – there is a specific draw pile and discard pile for each era. There is a Power Board that is placed in the center of the table. 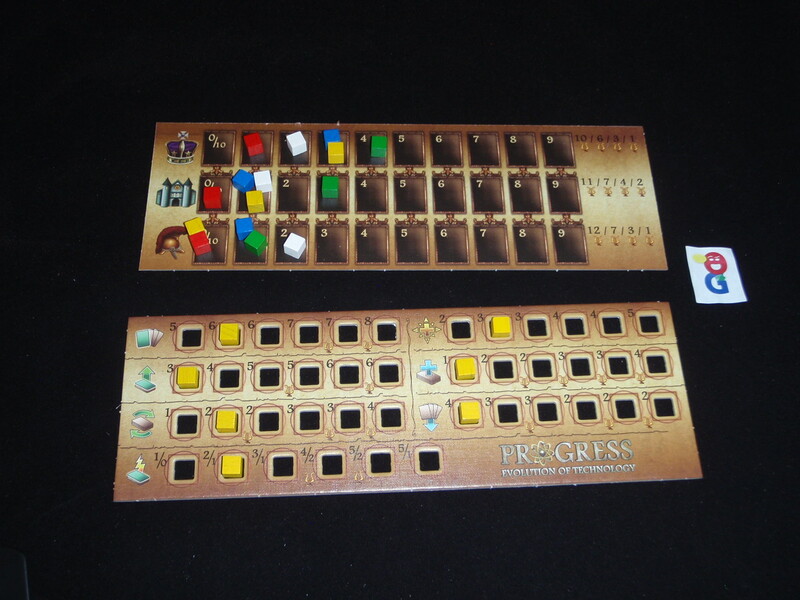 Each player places a marker on each of the Prestige, Population and Army tracks. Players will advance on these tracks depending on which technologies they are able to create. The game is played in a number of successive rounds – the game starts with the Start Player and goes clockwise until the game immediately ends when the end game condition is met. Each player turn consists of the same three phases. Action Phase – in this phase, you get a number of actions equal to your current Action Skill as noted on your player board. If this increases during the course of the turn, you also get to take that added action now. There are five possible actions: Discover, Research, Quick Draw, Shuffle & Draw, Draw. Discover – you will play a card from your hand and place it in your Active area. To do this, you must pay the appropriate costs for the card. Again, the costs can be paid for either by having the correct prerequisite technology in your player area or by paying an amount of knowledge. Knowledge can come from cards discarded from your hand or from Knowledge tokens. 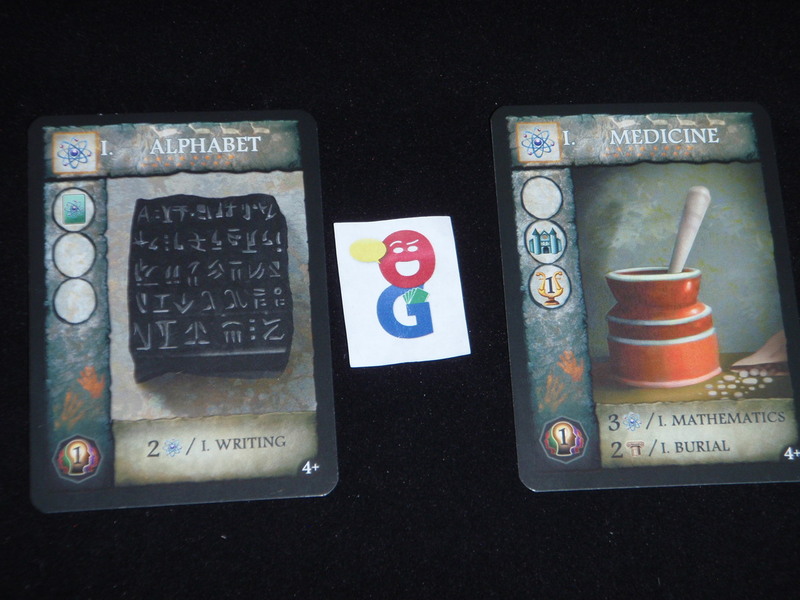 These tokens are generally gained from previous card plays, and each of them represents one unit of knowledge that can be spent once each turn. These tokens can be of a specific type or can be of General (i.e. wild) knowledge. If you are able to pay the costs of the card, it goes in your Active area. You now look at the three circles on the left hand side of the card to see if you gain a token or skill, get to move on one of the Power tracks, or get VP at the end of the game. Research – Sometimes you just don’t have enough resources or smarts to discover a technology now; so instead, you can research it over time. To Research a card, you place it off to the side of your area, and cover it with a number of black cubes equal to your current Research skill. As you are researching this over time, you don’t have to pay any other costs right now. Each turn, in your first phase, you will remove one of these black cubes, and once all the cubes are gone, you will have discovered whatever is on the card. You don’t get any of the bonuses (skills, advancement on the tracks, VPs, etc) until the card is completed. However, it should be noted that you are able to use a skill under Development as a prerequisite for future Discoveries. You are limited to a number of Technologies under Development as listed by your Development skill. Draw – This is the main way to add cards to your hand. However, once you take this action, you are not allowed to use any more actions on your turn – so you should save this for your final action on any given turn. You are able to draw a number of cards equal to your current Draw skill. These cards can come from any available face down draw pile or from any face up discard pile. You can draw cards one at a time and look at them before deciding where to draw your next card from. Quick Draw – in the midst of your turn, you might need some more cards while still doing more actions. In this case, you could choose to Quick Draw. In this action, based on your Quick Draw skill (X/Y), you draw X cards from any available source and then you must discard Y cards from your new hand – note that you do not gain any knowledge from discarding cards in this manner. Shuffle & Draw – when you take this action, you first shuffle as many discard piles into their respective decks as your Shuffle skill allows. You can choose the same deck multiple times. Once shuffling is done, you may then draw a number of cards from any available sources equal to your Shuffle skill. Upkeep Phase – once you are done with your actions, you must discard cards from your hand to meet your current Hand Limit. Additionally, you flip all of your Knowledge tokens over to their active side so that you can use them again on your next turn. At the start of the game, a number of Era markers are placed near the center of the table – the numbers of each are based on the number of players in the game as well as the desired length of the game. 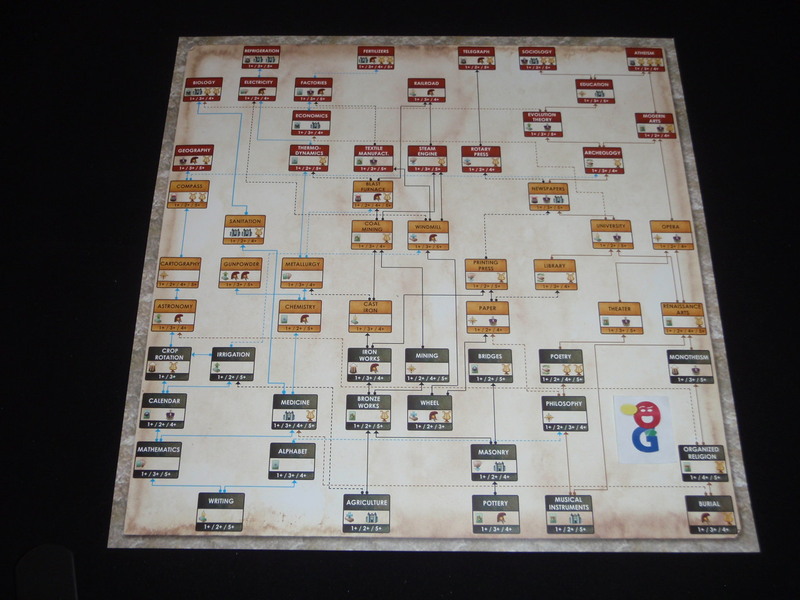 For example you might have placed 2 Era II tokens, 3 Era III tokens, and 3 Era IV tokens next to the board. As players discover some technologies, some of them may have the Era advancement icon on them – each time an Active technology shows one, you discard a matching Era token from the table. Once all of the Era II tokens are removed, then the Era II deck is introduced to the game. You can now draw and play cards from this Era. The Era III deck similarly comes into play when the appropriate number of technologies with the Era III icon on it are Active. As there are only three eras in the base game, the game ends immediately when the final Era IV token is removed from the table. When the game ends, all that is left to do is score the game. There are three ways to score points. Players score points for any printed VPs on their ACTIVE technologies. Technologies under development score nothing. Players score points based on their standing on each of the three tracks on the Power Board. 10/6/3/1 VP for 1st/2nd/3rd/4th place on the Prestige Track. 11/7/4/2 on the Population track. 12/7/3/1 on the Army track. Ties are added, divided and rounded down. I should also note that there are three expansions included in the box, but I haven’t had a chance to play any of them yet, as I’m still exploring the base game. 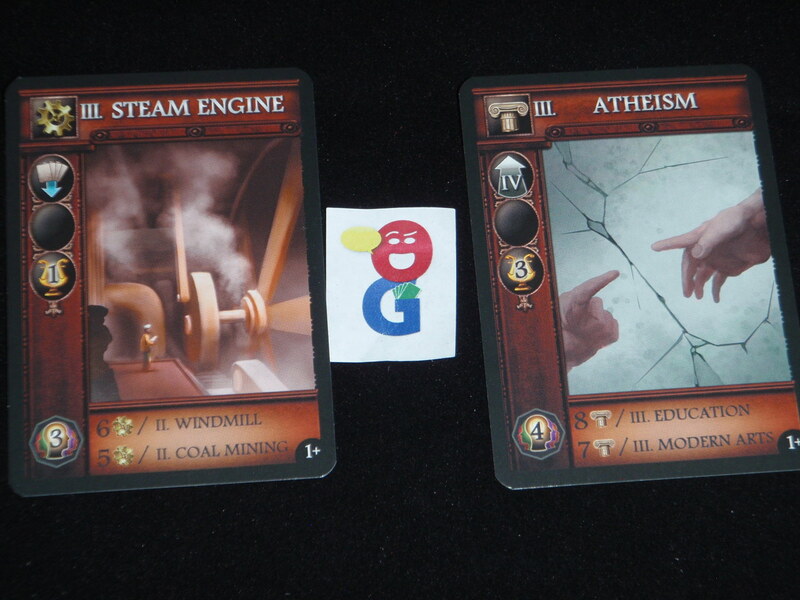 The biggest one is a full deck of cards for Era IV – this deck takes the players through the Industrial Revolution. If you use this, the game now goes through four eras. This expansions also creates new bonuses based on the numbers of each of the three types of technologies that you have discovered. There are also 2 other mini-expansions included: Personalities and Milestones. These can be added in on their own or played with any of the other expansions. Progress has proven to be a fascinating game. I’ll admit that I wasn’t sure what to think of it at Essen, and I did go by the booth a few times to try to check it out. However, all of the demo tables were usually full, and by the time that my meeting with NSKN was set up for late Saturday afternoon, they were essentially sold out of the game, and therefore, they didn’t have any more copies! I was delighted to hear that Passport Games has chosen this one to import. It is part of a very solid class of games from the most recent Essen. Progress is a straightforward card game that sticks to its strength – the entire game is based around the tech tree. Unlike other more complex games that use a tech tree as one of many mechanics within a game, Progress chooses to focus on just this one thing, and I must admit, it does it well. The technology cards mesh together well, and there is enough interweaving of the tracks that it is hard to be left behind by the game. Unlike some other games where the tracks on the tech tree separate at the origin and then continue to branch out, the paths in the Progress tree repeatedly converge and diverge. Thus, as long as you are able to build some cards, you will end up with some of the prerequisites for later technologies. In the front of the rules, the designers of the game explicitly state that they had to make some discretionary decisions on placement or prerequisites for some technologies in order to keep game play moving in the right direction. I don’t have any problem with this as I can see the game as a technology tree game – they could have called them anything and I would have used the cards provided to play the game. I have had discussions with some gamers that were bothered by the fact that “Atheism” was one of the final technologies of Era III – but as a history student, I can certainly understand how this could have been included in the cultural track… though perhaps in an earlier timeframe than the start of the Industrial Revolution. (But again, the designers again have already apologized for some literary license in order to keep gameplay moving along…) But again, I also generally don’t let stuff like that bother me. I also never blinked an eye at “slaves” in Puerto Rico or Five Tribes. I’m playing a boardgame using wood and cardboard bits, and I leave any social/political commentary aside and just play the game. The only thematic thing that I don’t necessarily agree with – in the thematic sense – is the fact that you can use technologies under development as prerequisites for new active developments. However, looking at this from a game developer’s standpoint, it’s a great mechanic to allow players to continually move forward as well as giving them some other options in what would be a game of narrowly defined choices. As it stands now, you have 5 action choices: 2 ways to play cards and essentially 3 ways to draw cards. That’s it. Think what it would be like to only have 1 way to play cards. However – this mechanic allows players to “jump back on the tech tree” if they have been somehow shut off of a branch – i.e. other players have already played that only cards at that level. With good timing, it can allow you to enter a whole new Era entirely because one (or two) cards under development can then allow you to play many different cards for free… Sure, it seems silly thematically to finally develop the Wheel (which you started 4 turns ago) when you already have a Blast Furnace and a Printing Press – but without it, there would be no way to catch up. The technology cards seem to be well balanced. As I mentioned earlier, I like the way the tree weaves back in and around itself. I also like the way that the rewards of the different cards are spread out. There are certainly times that you want to build a technology solely for its immediate effects such as knowledge tokens or track advances; there are also times you want to get a card onto the table so you can use it to build other more advanced cards in your hand. The majority of the scoring comes from your progress on the three scoring tracks, and I have found that you don’t have to be the player who has played the most civizilation cards to win – just choosing the “right” ones can work out well for you in the end. The artwork and overall production of the game is high. The feature art on the development cards is very good for the vast majority of the cards. The cardstock is thick and our Era I cards – which have received the most play – are holding up well thus far. The only part of the design that I might have changed are the spaces on the Power Board. When playing with 5 players, there are a lot of cubes on a fairly small track; it would have been nice if this board were a bit bigger so that little jostlings didn’t risk upsetting the location of the cubes on the tracks. So far, I’ve played at least once with each number of players (1-5). Our first game was with the full complement of 5, and we played with the suggested shorter rules (reducing the number of Era tokens needed to finish an Era as well as letting all players start the game with 2 Actions a turn). With 5 players, this felt just right for us. While you certainly need some time to check out your hand and figure out what cards you can build, there is nothing really to do when it’s not your turn, and there is very little effect that another player’s turn will have on yours – you might be interested in which card(s) they discard, and their movement on a particular track might sway which card you might play in order to combat their movement. However, for me, the downtime was a little too high in a 5p game, and the game length was already nearly 2 hours. This downtime problem was easily solved when we played with 3. The turns seemed to come back to me just when I was ready to do something with my new hand, and it was a more engaging game. As you take out technology cards based on the number of players and alter the number of Era tokens needed to end an Era, the overall flow of the game is similar with fewer players, and you just get to take turns more often with less downtime. After 8 plays, I’d be willing to play with any number 4 or less, though I would probably still prefer 2 or 3. Of course, YMMV. There are also solo rules included, and I have tried it once. 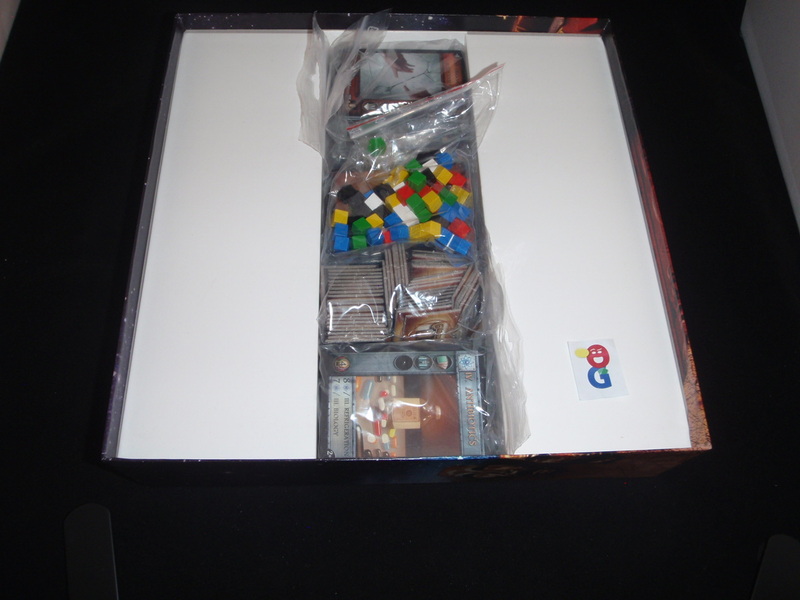 I’m a big fan of games that can be adapted to play solo – and Progress has nice game for 1. It is a bit different than the multiplayer game – you use a different Power Board to progress on – and you now have a timing mechanic where possibly discard cards at the end of each turn to a Time Deck. At the end of the game, you tally up your points (using similar methods to the multiplayer game) but then subtract points for cards left in the Time Deck. You compare your final score with a chart in the rules to see how well you have played, and you can always shoot to better your previous total. So far, I’ve played it with all the different player counts, and I’ve enjoyed each play, and I am looking to play it again soon. I’ll admit that I’ll likely not play the 5-player game without shortening it (using some of the suggestions from the rulebook to do so), and I’d rather play it with 3 players than 5; but that doesn’t change the fact that I still want to play it again. The game has focused on a single mechanic, and it provides you with a challenging puzzle as you try to progress upwards on the tech tree as efficiently as possible. Dan Blum (1 play): It works, but I thought it was incredibly boring. And it doesn’t work all that well; midway through the game there wasn’t much sensible to do except dig through the deck looking for the cards that I could play for free (or cheap) and which would let me play the cards I already had for free. This was fast enough that there wasn’t much point in doing anything else. The idea of a game all about the tech tree is a fine one, but this doesn’t do anything interesting with the idea. Lorna (1 plays): I agree with Dan. the game works but it seems a little tedious and your choices are pretty obvious. Multiplayer solitaire unless you are hoarding cards. The solitaire part doesn’t bother me but some people may not care for it. Craig (4 plays): I certainly appreciate Dan and Lorna’s comments on the game being a bit boring, but I’m more in line with Dale’s thoughts that the game provides an interesting puzzle to solve. I’ve played with two, three, four, and five players. I enjoyed the game much more with three which feels like the sweet spot for the game. Two players was an interesting tactical battle and race for key cards. My largest complaint was the lack of differentiation between the different tracks. Everything felt largely the same giving the experience a bit of a generic feel. I doubt this will be a long term keeper for me, but I can see it hanging out for another half-dozen plays. Michael (2 plays): I enjoyed it as a good hand-management game with a strong theme that I liked. Both of my games were 3-player, and I can certainly see downtime becoming an issue, especially at 5. It has a slightly lower power-to-weight ratio than I typically like, but certainly as enjoyable as most other half-hour-ish games of similar weight. Liga (4 plays): I like this game despite the fact it is a multi-player solitaire. Actually there is interaction in racing for some cards but not a real player vs player mechanic. The theme is not really emerging but the core mechanic is fine and it is a good playing experience. It will be nice to have the possibility to have some civilization differences as optional rules. Alan (2 plays): I backed the Kickstarter and was looking forward to this game as one of my highlights of Essen 2014. I like the game systems and how the evolution side works. The game is on the dry side, but this was what I expected so that wasn’t a surprise. It is more puzzle like than feeling of managing the civilisation change, but for my group that’s fine. The presentation is good and the additional cards provide sufficient variety for me to see more plays in the coming months. It did not live up to my pre-Essen expectations but that was more to do with me than the game. Greg S. (1 play so far): I am on the fence about this, but with only one play under my belt so far, I really cannot give it a fair assessment. I do find it purer than most tech-tree games, so it is not muddled or confusing. However, as Dan says, I often felt I was just digging through the deck seeking cards I could build cheaply. That aspect wasn’t terribly exciting. I am hopeful that with more plays I will better understand the relationship between the cards and will be better able to determine the optimum plays. At the moment, I remain intrigued. Mark Jackson (1 play): I think it’s an interesting puzzle more than an exciting game… and I’d be unlikely to say “yes” to it again with more than 3 players, as the downtime was a bit much. That said, Dale didn’t sell it to me as anything but a pure tech-tree game, and it is exactly that (f that’s the kind of thing that floats your gaming boat). I will say that the progression of Opera leading to Modern Art leading to Atheism made me chuckle. Neutral. Lorna, Greg S, Mark J.